Gianna Mancini does not have your average problems. Sure, her family is loud, her love life complicated, and her career still struggling to get off the ground. But Gianna has unique problems too...she sees dead people. And when a small explosion happens not far from her home, Gianna discovers the ghost of Thomas Sterling, son of the Sterling automotive empire. He refuses to move on to the afterlife until Gianna tells his fiancée, Serena, that he loves her. Not one to let the dead linger, Gianna locates the woman and passes on the message...but nothing is ever as simple as it seems. One message from the beyond turns into a warning to the very much alive, and Gianna suddenly find herself trying to keep Serena safe. 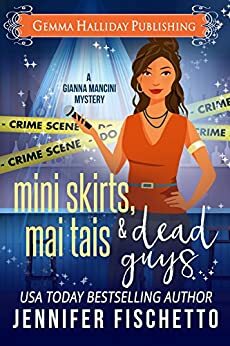 Between her duties to the dead, auditioning for a singing gig, and trying to get rid of Freezer Dude, a pesky ghost from her past, Gianna has her hands more than full. With help from her boyfriend, Julian, and her cop brother, Enzo, Gianna needs to find the killer fast...before she end up on "the other side." "It grabbed me by the hand and pulled me in, not letting go until the very last page. Highly recommended." ~ Melody's Bookshelf on "Unbreakable Bond"
"Weaves mystery with laughs (and a few tears). This delightful tale is a definite read! I would read it again as well as the rest of the series." ~ Should You Read This Book? Review Blog, on "Secret Bond"
"The characters are always so well written. They feel like they could pop off the page. I can’t wait for the next book in the series!" ~ Wakela's World on "Secret Bond"
"I approached this book with the idea that it would be the light reading many of us look forward to enjoying in the summer. It turned out to be more than that and I couldn't put it down." ~ The Birch Bark on "Secret Bond"
Gianna is back with her funny eccentric family and ger gorgeous man Julian for another ghostly murder mystery. I'm pretty sure I love this one more than the first book in this funny series but it's a close call. Gianna is awesome, her ability to talk to ghost certainly keeps the story entertaining and I love her whity sarcastic laid back approach to life. I also enjoyed this second book more as we see Gianna come to accept her relationship with Julian more and accept that his job has grey lines to it. Gianna also discovers her life is not as black and white as she thought and that's not necessarily a bad thing. So when I bomb kills a man who is pretending to be someone else it ends up being more of a mystery within a mystery and Gianna with the help of Julian scramble to put all the pieces together. A thoroughly enjoyable mystery with a few twists and turns. Reminds me of Janet Evanovich. I thoroughly enjoy her books and it's easy , fun reading. 5.0 out of 5 starsI know cozy and paranormal do not traditionally go together but what do you call an amateur mystery with lots of humor? Two Ghosts & a Love Song is a fun paranormal cozy mystery. I really enjoyed the first book so I had to grab this one. The book is written in first person which can be irritating in places but I can't imagine it working any other way. Gianna's ability to see ghosts and help them cross just feels right to her until she encounters a ghost from her past. This one isn't lost or seeking help to cross, he has come back from the other side and he wants to stay here. Although Gianna doesn't believe he can hurt people, he is creepy and he does have a plan that makes her feel that she has to find a way to get him where he belongs. In another case, a ghost lies to her. How can that be fair! Ghost's shouldn't be able to lie. How can she help him cross he if he isn't willing to open up to her. Things sure aren't what they seem anymore! For fans of the first book, Julian is back. He is willing to help her any way he can while she figures out if she can live with the impact of his job. I first discovered this author when the cover and title of book 1 caught my eye. While we've all heard the whole "not judging a book by its cover" saying, I figured with a title like that, the book had to be great. I wasn't wrong. Book 2 is equally as great. It has humor, ghosts, and a mystery. Added to the mix is family banter and devotion. The only thing I don't like is the wait time between books, but only because I'm impatient. A great, long, and well-written book is worth the wait. Highly recommend this series. This is a great book. The characters go well together and the mystery is fascinating. Gianna talks to ghosts, solves murders and troubles with her boyfriend. She tries for a singing gig, puts up for an enemy cop, and has a criminal ghost trying to take over human bodies. Gianna gets her brother, Enzo (a cop), to help her out. 5.0 out of 5 starsOne of my favorite series. Jennifer Fischetto has another hit series with Gianna!